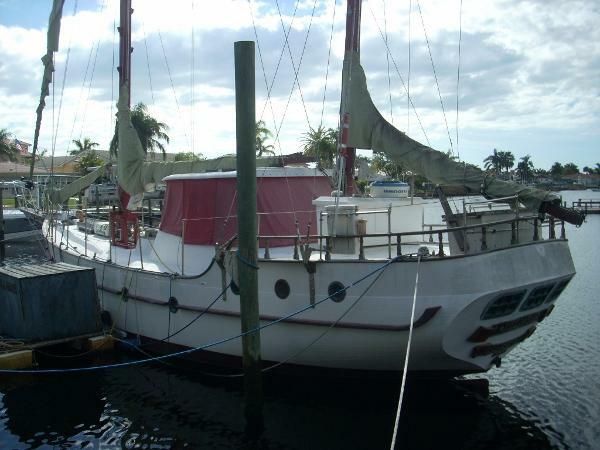 1984 Island Trader 51 Ketch 1984 Island Trader 51 Ketch Needs new mizzen mast and repairs on main mast. Sails: Oversized jib with new roller furling imported from Brazil; cutter sail, main sail, mizzen sail. Fiberglass hull, new fiberglass deck; cockpit and trim in teak. Almost all new shrouds, sheet, and lines. 120 horsepower Ford Lehman Diesel, 6 cylinder; 8.5 kts. Westerbeke 38112 Generator. New battery-operated bow thruster - remote controlled. 110 and 220 shore power with new 30 amp triple charger. New aluminum fuel tanks. VHF radio, heat warning system, radar (needs to be calibrated and reinstalled), depth finder, ruder position, GPS, autopilot. Two cabins - forward and aft, bunk beds forward, queen bed aft. Two heads - forward (electric), aft with bathtub. 3-burner propane stove and oven, new marine refrigerator and freezer, microwave, toaster, food storage. Air conditioners forward and aft. Triangular table and settee in salon which converts to a double bunk. 20 gallon hot water tank, water maker, and new emergency hand pump. Washer (needs water level float) and dryer. New deck supports and inside ceilings and walls. New stainless steel windlass. Most water pumps new. All manuals available, tools, spare parts, etc. Lots of storage and hanging closets. 6-man life raft 6-man inflatable dinghy with 15 horsepower outboard engine; Located in Tampa, Florida. Call Scott for more info at 813-926-2400 or toll free at 888-866-1380. 1984 Island Trader 51 Ketch (LOCATION: New Port Richey FL) The Island Trader 51 is a big blue water sailing yacht with classic good looks, tons of room, and teak interior. A William Garden design, she is built to carry you where ever you want to go comfortably, safely, and in style.She features a large teak deck with extended bow pulpit, anchor with chain, and a new windlass. The enclosed helm has hard top fitted with solar panels, red curtains, and center helm with teak ship’s wheel, compass, and auto pilot. Behind the helm is an elevated aft deck with reversible bench seating and stern anchor.The interior features teak bulkheads and trim. Amidships is an open salon with convetible dinette with dining table. There are teak cabinets to storage everything you need for an extended cruise or the necessities for living aboard. There is a nav station with chart table and VHF radio. Across from the the dinette is a full galley with gracefully curved pass through. This 51 has two private staterooms. Forward is the guest stateroom with double berth and aft is the master stateroom with double berth.This 51' Island Trader has 120-hp Ford Lehman diesel engine, a Westerbeke generator, a new Lewmar bow thruster, and a water maker. Electronics & navigation equipment includes: Furuno Radar, Simrad Robertson AP22 Auto Pilot, Garmin GPS, Horizon Depth and Speed Displays, Horizon Spectrum VHF Radio, and Ritchie Compass. A tender with 15-hp motor is included for access to thin water beaches. 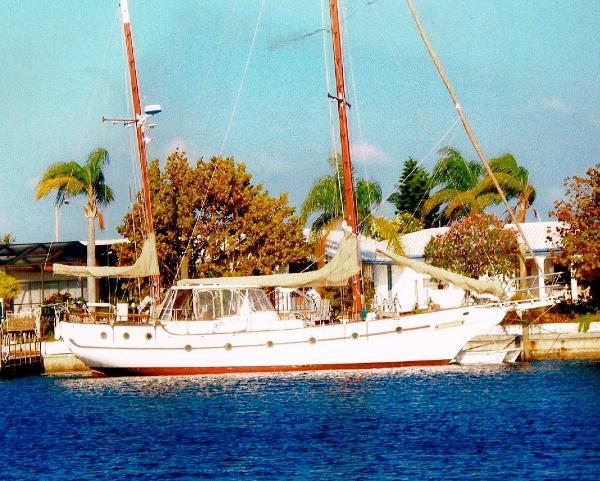 She is well maintained and ready to sail.Recent upgrades include new fiberglass deck and fresh bottom paint (see the included photos of the work being done).Call now for more information and to schedule a showing.